When you have all the comforts of home, privacy, and space for a garden and animals, why would you want to head out to make the commute every morning? Everything you need to live a good life is here – a master bedroom with a walk-in closet, a spectacular master bath with garden tub, tile shower, and double sinks; a beautiful kitchen with a stainless side-by-side bottom freezer refrigerator, double oven, microwave, tile floors, a pantry, and abundant cabinets; a living room with river rock fireplace and built-in cabinets; two guest bedrooms with a guest bath, and a downstairs powder room. Have toys? Projects? You’ll love the three car attached garage with plenty of space for work or fun and room left over for your vehicles. For nature lovers, the Wyman Wildlife Habitat is just down the road and provides over 7 miles of trails. 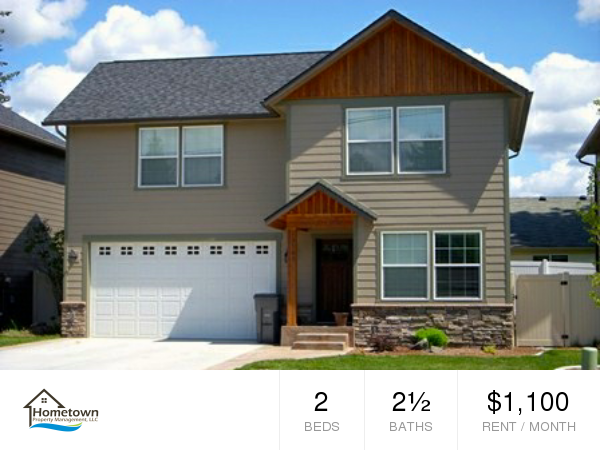 Relax, refresh, and enjoy the beauty of North Idaho in this custom home just 21 miles north of Sandpoint. Stunning 4 Bedroom 2.5 Bath Home w/2 Car Garage in Hayden! Looking for a larger home but don’t want to sacrifice the country charm? Welcome home! 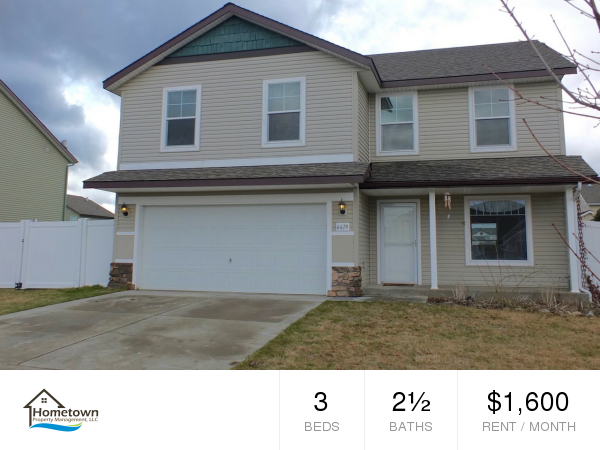 You’ll be greeted by beautiful curb appeal and a covered front porch where you can relax on warm summer nights sipping lemonade and waving at neighbors as they stroll through this great neighborhood in the Strawberry Fields Subdivision in Hayden. This stunning home with beautiful paint, plush carpet, and luxury vinyl plank flooring features four bedrooms, two and a half bathrooms, a living room, and a family room in a two story floor plan. The living room with large picture windows allows for lots of natural light and opens up into the kitchen and dining area. The kitchen features oak cabinets, a pantry, breakfast bar, stainless steel sink with dark bronze faucet, a garbage disposal, and stainless steel appliances including a bottom freezer refrigerator, dishwasher, glass cooktop range/oven, and microwave. The dining room has a sliding glass door that leads to the concrete patio and partially fenced backyard and storage shed. The guest bedroom downstairs can be used as an office or den. There is a half bath off of the laundry room with easy access to the completely finished garage with an epoxy coated floor. Upstairs, the master bedroom features an en-suite bathroom with a granite tiled tub/shower surround, dark bronze fixtures, and good sized walk-in closet. There are two additional bedrooms, a bathroom with tub/shower combo, and a family room which spans the length of the two car garage below. Forced air A/C and a natural gas furnace will provide you comfort for all seasons. Professional mowing is included to give you extra time and keep the property looking beautiful without the hassle. Looking for a larger home but don’t want to sacrifice the country charm? Welcome home! You’ll be greeted by beautiful curb appeal and a covered front porch where you can relax on warm summer nights sipping lemonade and waving at neighbors as they stroll through this great neighborhood in the Strawberry Fields Subdivision in Hayden. This stunning home with fresh paint, new carpet and luxury vinyl plank flooring features four bedrooms, two and a half bathrooms, a living room, and a family room in a two story floor plan. The kitchen features oak cabinets, a pantry, breakfast bar, stainless steel sink with dark bronze faucet, a new disposal, and stainless steel appliances including a brand new bottom freezer refrigerator, dishwasher, glass cooktop range/oven, and microwave. The guest bedroom downstairs can be used as an office or den. There is a half bath off of the laundry room with easy access to the completely finished garage. Beautiful and efficient home built in 2008 with fenced back yard, covered front and back porches and a two car garage. 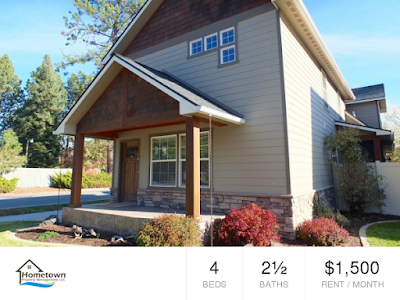 This centrally located home in Coeur d’Alene is close to everything and features many upgrades. Main floor includes kitchen, living, dining, and half bath with laundry. Kitchen is fully equipped with knotty alder cabinets, dark bronze fixtures, and Energy Star appliances including refrigerator, range/oven, dishwasher, disposal, and microwave. 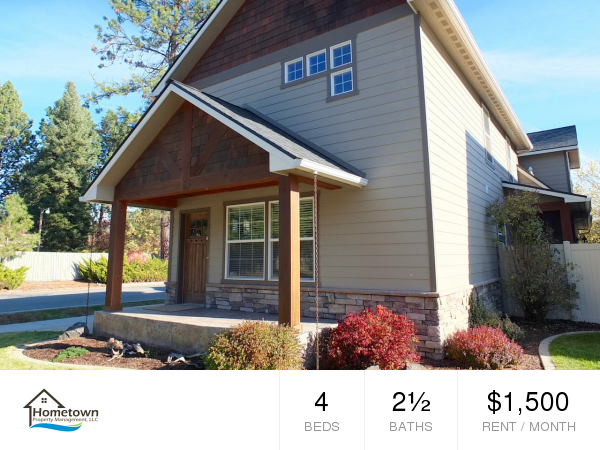 Upper level has four bedrooms, and two full bathrooms with tub/shower combos and a double sink in the master bath. Spacious master suite features walk-in closet and ceiling fan. Efficient heat with a forced air furnace and A/C. Beautiful and efficient home built in 2008 with fenced back yard, covered front porch, and double car garage. Main floor includes kitchen, living, dining, 1/2 bath, and laundry room. Kitchen is fully equipped with Energy Star appliances including refrigerator, range/oven, dishwasher, disposal, and microwave. Additional kitchen features include custom Alder cabinets, breakfast bar, and tile backsplash. Pets approved on a case by case basis and with owner approval. Welcome home! This beautiful 3 bed 2 1/2 bath home located in the Hawks Nest Subdivision is awaiting your arrival. The two story floor plan features an open and inviting living room with a large window for natural light. Kitchen amenities include plentiful cabinets, a pantry, a breakfast bar, dishwasher, natural gas range/oven, refrigerator and a breakfast nook. A formal dining room off the kitchen and breakfast nook provides additional space for entertaining. The large master suite with a ceiling fan has a walk-in closet and a spacious bathroom with double sinks, standing shower and garden tub. Two guest bedrooms, another full bathroom, a half bathroom and a large family room round out the living space. A separate laundry room upstairs includes a washer and dryer for your convenience and the two car garage will keep your vehicles protected from the elements. Additional features included a forced air natural gas furnace as well as a gas hot water heater. The sliding glass door off of the breakfast nook leads to the a fully fenced backyard with complete sprinkler system. Pets are considered on a case by case basis and upon owner approval.